In the age of the Internet of Things (IoT), tons of everyday items are being connected to the internet. Televisions, smart speakers, even toasters are put online so people can get more use out of them. Vending machines are no exception. Through telemetry, vending machines can be put “online,” which means they can connect to the internet. Information like inventory levels, sales data, and even machine status (think breakdowns or compressor issues) can be communicated to a vending operator. This data can then be used with tools in a Vending Management System (VMS) to increase sales, boost customer service, and decrease operational costs. To see exactly how much a vending operation can expect to gain from online machines, we’ve conducted a study of online vs. offline machines being used in the Parlevel VMS. Online vending machines have a distinct advantage over their offline counterparts. With telemetry, machines report sales and operational data constantly – keeping track of inventory and other indicators. Since this information is available remotely, operators know which machines need servicing and exactly what product to bring without the need to physically be there. The process of routing and packing inventory before visiting a machine (known as prekitting) can improve service time by 30%. Plus, online machines can send all types of technical alerts. Breakdowns, bill jams, coin jams, compressor status and other alerts are sent straight to an operator’s VMS. This helps a vending operation take a proactive approach to repairs. Instead of waiting for a location to call and complain, a problem can be solved before it starts. This results in boosted sales and better customer service. With online vending machines, it’s easy to know exactly how much cash and cashless sales a machine is experiencing. So when a driver goes to service machines for the day, operators know exactly how much money they should be returning with. This increased cash accountability leads to more money in a business’ pocket and better trust between operator and employee. These are just a few examples of the benefits of online machines. 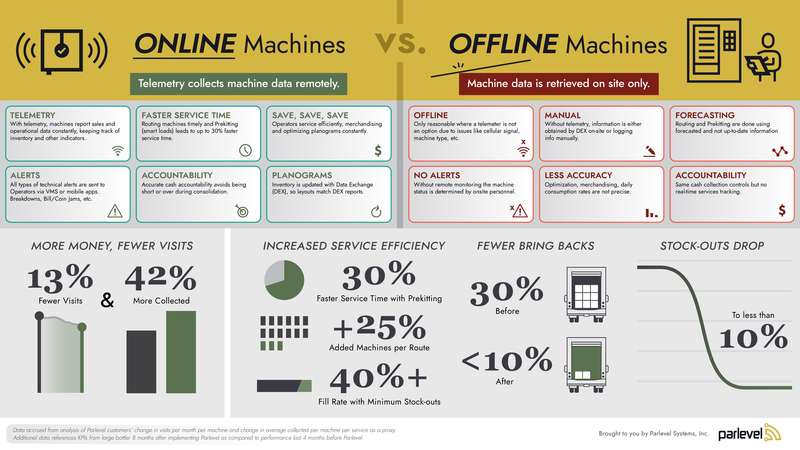 Overall, online machines connected to a VMS result in bigger pulls and fewer visits for operators. Operators using Parlevel’s VMS can expect to experience up to 13% fewer machine visits per route, while collecting an additional 42% in sales. These are substantial operational gains. Of course, not every vending machine can be put online. For example, some older machines physically cannot accept telemetry devices. Machines placed in an area with bad cellular service (basements, prisons etc.) cannot get a signal to communicate via the internet. However, a good VMS can still work with offline machines. In this scenario, forecasted data can help businesses gain efficiencies with those offline machines too. While they won’t be quite as accurate or impactful as online machines, the benefits are still significant. What can we learn from all of this data? If operators want to increase revenues, boost operational efficiencies, and provide better service, putting your machines online is a no brainer. Not every machine can be put online, but offline machines are reasonable where a telemeter is not an option to due to issues with cellular signal or machine type. With the proper VMS, a vending business can effectively manage both online and offline machines together to maximize operational success.